Manchester United could face a tall task in keeping Anthony Martial at Old Trafford this January, with Chelsea and Juventus keen on signing the forward, Sky Sports have revealed. The Red Devils have braced for interest from the two clubs in January following a sudden purple patch for their forward, where the Frenchman has scored six goals in the last seven games he has played. Chelsea and Juventus have both been linked with Martial since the summer, when reports emerged about the 22-year-old’s disillusionment over life at United, and his willingness over finding a new club. 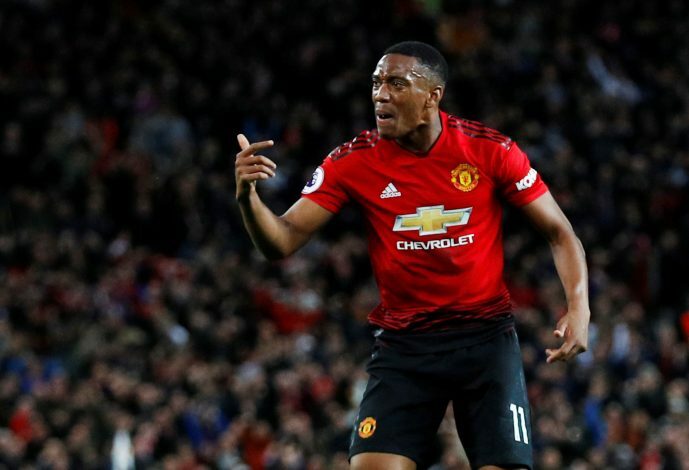 The Mancunians, however, have played hard-ball, and want Martial to sign a new contract that keeps him at the club for a significant period of time as well as scares off any predatory clubs as a result. A fresh round of discussions have been opened, but an agreement seems far away at this stage, and with Martial’s good run of form, United want the player to keep on improving. Juventus may have come to terms with the fact that one of their main forwards, Paulo Dybala, could be moving on, and they want a player just as capable as the Argentine to fill in. Moreover, Cristiano Ronaldo could do with some added fire power up front for the Bianconeri, and Anthony Martial may well be the man to provide it. Chelsea, on the other hand, know that they need an attacking edge of their own after Alvaro Morata’s inconsistent performances and the impending threat of losing Eden Hazard to any of Europe’s top clubs. The Blues have changed their style of play under new boss Maurizio Sarri, and the addition of Martial should suit the current system well, along with being one that completes the side and enables them to fight for the Premier League title.